FLV files are mostly used by the online video sharing site that’s why mostly people get the videos in the FLV format after downloading from the online sites. If you have downloaded the FLV from the video site and looking to convert it in the most common MP4 format then you can do it easily. There are many easy to quick ways available to convert FLV to MP4 online and offline. To convert files in the MP4 format you can now read this article and get the solution of your problem. 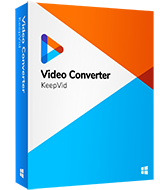 KeepVid Video Converter is all-in-one video converter software for Mac and Windows. All in one because it converts, download and edit the videos and audio files to make them more useful. It has the power to convert the videos in mostly all devices readable formats very quickly. This is really great and high quality converter software over internet which finishes the tasks with 30x faster speed and converts the files in the original quality in the selected output format. Easy to use convert option which allows you to convert audio and video in more than 1000 formats. Very effective video downloader enables you to download online videos to watch offline. A powerful video editor is also there to help you out to edit and make your video more beautiful. Automatically download and convert videos. Convert videos from ISO, IFO and DVD directly. Step 1. Start KeepVid Video Converter and add FLV file from your computer. Step 2. Select MP4 as an output, and click the Convert button to start converting FLV to MP4. Go to the official website of KeepVid Video Converter and finish the installation after downloading installation file. Now click “Add Files” option in the convert menu and import the videos from system which you like to convert. You can prefer to watch HD MP4 quality. Now choose click the upside down icon in the top right side and choose MP4 from the dropdown list. 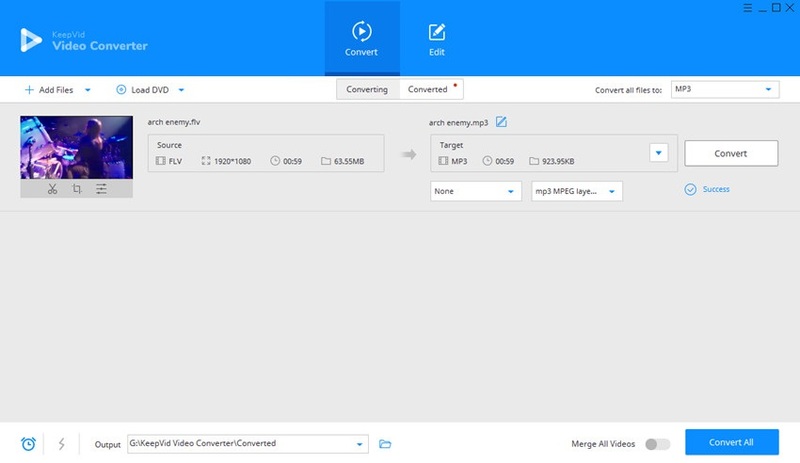 Once you have setup output format choose “Convert All” option and your video will be converted to the MP4 format. Never worry about converting MP4 to FLV anymore. With the help of KeepVid video converting solutions, you'll be able to get the work done in very easy steps. •	Download and convert FLV to MP4 directly with KeepVid Video Converter. •	Always convert the FLV video to the high quality MP4 video to get the original quality output. •	If you want to playback video before conversion then also you can do it by using this software because it supports all types of format playback. KeepVid Online Video Converter is a free video converter website that has a very simplest design used by any online converter website. This is a fully featured converter website and enables you to convert audio and video in 60 formats. Using of this website is very easy. You simply need to select the audio or video from computer, select target format and click “Convert Now”. That’s it. This converter website works great as it promise to its users. Name of this website is little bit confusing because people think that this is an MP3 converter website but actually it supports 6 audio formats and 4 video formats where MP4 is also included. 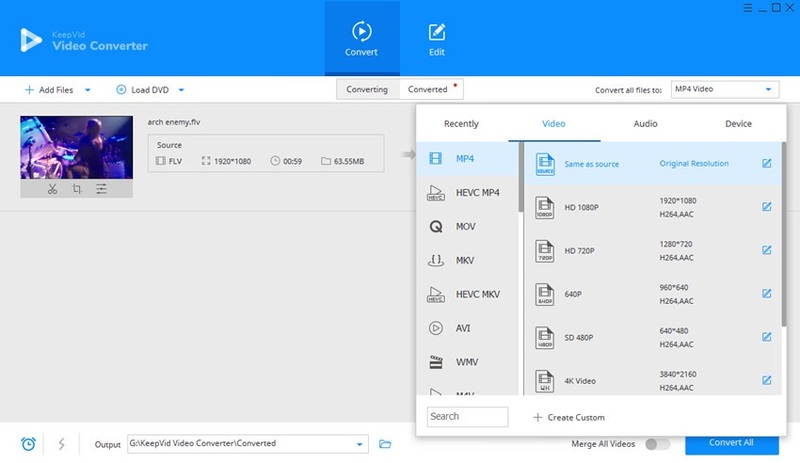 If you have find any video over interface in the FLV format then you can convert FLV to MP4 with this FLV to MP4 converter online website. Movavi Video Converter is simply video converter software with faster speed and average quality output. With this converter program people can convert audio and video in nearly all popular formats. It is very useful for you if you have the movies and music videos in FLV or other format which are not compatible with your current media players. In that condition you can quickly convert the videos in your player compatible formats with this program. Freemake video converter can convert videos in the massive amount of formats without any charge. Allows you to burn videos to disk after conversion. Download videos from YouTube and other sites and you can also upload the videos to YouTube after converting them with this program. This is another great desktop converter software for the system available for free to use. It supports video conversion one by one or in batch depending on the user choice. It comes with many features such as devices list, editing videos, cutting, cropping etc. There are tons of options provided in this program to make your videos beautiful. 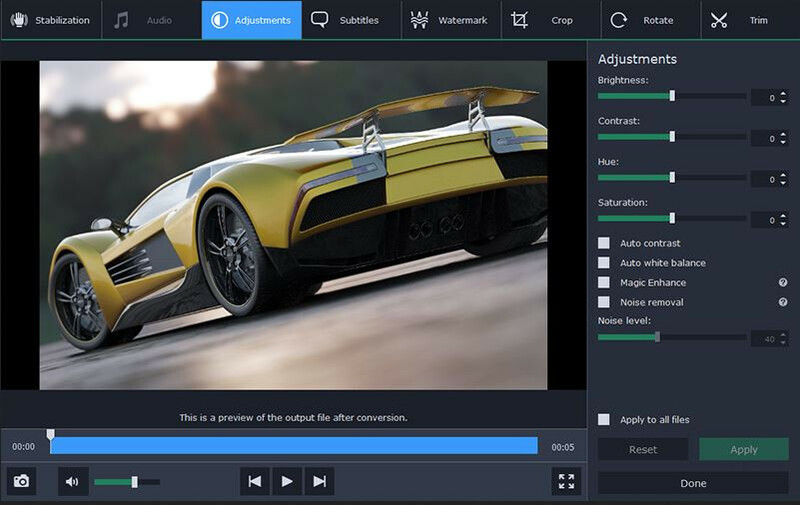 Convert audio, video and images in a single software. You can also edit the videos after or before conversion if it is necessary for you. Share to converted files over internet directly using this program.